In the Lapland Hotel Tampere, you can feel the warm atmosphere of meetings. This is highly due to the wide variety of meeting rooms with the addition of nearby Tampere-talo; the largest concert and congress centre of the Nordic countries. Our hotel is an easy way to accommodate and arrange smaller meetings for many visitors of Tampere-talo. The Lapland Hotel Tampere is also a centre of many kinds of meetings. The hotel has five different and versatile meeting rooms, and they can seat up to 160 people. Or request for an offer here! There are daily connections to Tampere from Helsinki and Stockholm by airplane. Taxis are on call at the taxi stand in front of the airport in accordance with flight schedules. If you want to confirm a ride or you have special requests, you can book a taxi in advance. It takes abotu 20 minutes to reach the hotel from the airport. There is a bus connection between Tampere city center and the airport (bus no 1). Schedules are available on Tampere public transport website. Tampere Railway Station is located just beside Lapland Hotel Tampere. The railway station is about 5 minutes walk from the hotel. To reach the hotel first follow the central walkway tunnel from the railway station to Itsenäisyydenkatu. When exiting from the tunnel walk up the stairs on the right to Tullikamari plaza. Walk over to the opposite left side corner and on to Tullikatu. Walk along Tullikatu to Yliopistonkatu junction. The hotel is to your right. As you walk towards Tullikatu you may also spot the white Lapland Hotels logo on the wall of the hotel building. 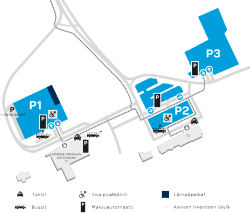 If you want to take a taxi from the Tampere Railway Station to the hotel you can get a taxi from the taxi station which is located just in front of the main entrance to the railway station. When arriving to Tampere from Helsinki or Turku continue driving on Lempääläntie for 1 km after the highway ends. Then turn left to Ratapihankatu and follow until the street makes a gentle turn to the right on to Åkerlundinkatu. Drive on until you reach the Yliopistonkatu three-way junction. Turn left and continue for abour 200 m, Lapland Hotel Tampere will be on the left side. Lapland Hotel Tampere has its own parking hall located in the basement of the hotel. Parking charge is 19 €/night, paid to the reception during check-out. Entry to park hall is from Pinninkatu. Detailed instructions and further advice is available from the reception. A functional conference environment, mixed with experiences of authentic flavour are the centre of our meeting packages. You can choose from a multitude of meeting packages for your different event needs. We have put together all the ingredients that are needed for a successful full day meeting. The time you will spend with us is efficient and pleasurable. The conference package includes morning and afternoon coffees, lunch, ice water for the meeting room and the meeting room, when there are at least 10 participants. You can choose either the best moments of the morning or the afternoon for your meeting. The meeting package includes morning or afternoon coffee, lunch, ice water and meeting room, when there are at least 10 participants. Lappi on pehmeiden villasukkien maa. Niiden kauneutta ja käytännöllisyyttä on arvostettu vuosisatojen ajan. Antaessasi kokousvieraillenne palan pohjoista villasukkien muodossa, muuttuu tapaamisenne tunnelma jälleen astetta lämpöisemmäksi. Hotellimme laaja viinivalikoima tarjoaa myös raikkaan kuohuviinin. Juhlaa tai arkea, aina on hyvä hetki skoolata. Tämän lisäksi tarjolla pohjoisen suolaisia suupaloja. 15 € / hlö. Tuote sisältää kaksi kaatoa kuohuviiniä osallistujaa kohden. Anna kokousvieraillesi hetki aikaa nauttia huoneen näkymistä ja tunnelmasta huoneeseen vietävien herkkujen avulla. Kuohuva karpalojuoma ja Lapin marjoilla maustetut makeiset vievät ajatukset luonnon äärelle. Kuivattuja hedelmiä, pähkinöitä ja makeisia, siitä on kunnon napostelupöytä tehty. Pieni purtava pitää kokouksen kuin kokouksen monipuolisena. At the Lapland Hotel Tampere, there’s a suitable meeting room for all! Five different and versatile meeting rooms can seat up to 100 people. We’ll answer your query in the kind and fair manner that Lapland is famous for! The meetings of genuine tastes take the meeting of guests to a journey of clean and fresh flavours. The meetings of genuine tastes take the meeting of guests to a journey of clean and fresh flavours. The stars of the meeting can be the cleansing effects of sap or blood circulation enhancing nutritional spruce catkin syrup – not to mention the arctic char of Lappish mountain waters or a reindeer from the clean nature of Lapland. In Lapland we appreciate each and everyone’s own style of work, and therefore, with us you can create a meeting that looks entirely unique for you. For the morning meetings, we offer fresh and natural tasty bites. During lunch, you can taste the delicacies of the forests and lakes and also soups. For the afternoons, we offer a selection of fresh juice and fruit. Have a short meeting with us, or enjoy your stay for longer. For 25 years, the timelessly stylish and versatile venue of Tampere-talo has hosted many kinds of meetings, congresses and events. Thousands of top professionals of their industries of science, economy, industry and culture from all over the world visit the house every year. Tampere-talo can host many size and kinds of meetings. The venue suits well for many events at the same time, or for a large meeting with parallel lectures and showrooms, and of course an evening ball. In Tampere-talo, there are 15 classy and comfortable meeting rooms of different sizes, starting from the Big Hall, seating up to 2,000 people and down to a VIP room for 24 people. Accommodation can be easily arranged with our partner, the Lapland Hotel Tampere. The rooms of Lapland Hotel Tampere are personal, beautiful and peaceful – everything that you wish from a good visit!